Color silent amateur footage (1940's-early 1950's) taken by Terminal Island resident Ben Fukuzaki, primarily of the Japanese American community in and around Fish Harbor, Terminal Island, and San Pedro, California. V. 57: Amateur footage taken by Terminal Islander Ben Fukuzaki on fishing boat. The edited film includes sequences of the Japanese American fishing crew onshore at Treasure Island, in Fish Harbor at Terminal Island, repairing nets, taking headings with a sextant, seining for tuna, etc. There are also some unusual shots of dolphins in the water, viewed from the masthead or crow's nest, and of the fishing nets being fed out from aboard the boat. 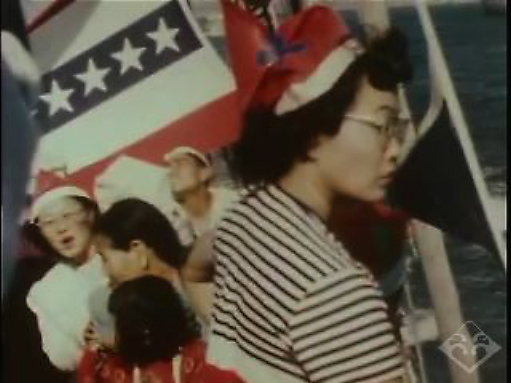 (13:34) V. 58: Amateur footage taken by former Terminal Islander Ben Fukuzaki during the San Pedro Fisherman's Fiesta in the late 1940s/early 1950s. Fukuzaki's boat "Nancy Rose" is shown passing by the French Sardine Company building in Fish Harbor, Terminal Island, and there are many long shots of the fishing fleet assembled in the harbor. Most of the boats are festooned with banners, bunting, paper lanterns, and other decorations. There are also shots of crowds of people enjoying themselves at a large picnic or potluck, where long tables are covered with food. (16:09) V. 59: Black and white amateur footage of a fashion show held by Terminal Island fashion school (?) shows Japanese American women modeling dresses, suits, evening wear, wedding gowns, and other clothes. One dress strongly resembles the gown worn by Snow White in Walt Disney's animated feature (released in 1937). On the same reel there is color footage of a bride and groom and bridesmaids leaving a church, including some interior scenes which are very poorly lit and indistinct. There is also footage of a football game, Christmas celebrations, and crowds and horse races at the Santa Anita racetrack near Los Angeles prior to World War II (16:32). Credits: Ben Fukuzaki Collection, Gift in Memory of Ben Fukuzaki, Japanese American National Museum (2002.1). Preserved and made accessible in part by a grant from the National Film Preservation Foundation. HNRC — Last modified Jul 25 2016 2:12 p.m.